MECHANEX Event City 2016 – What’s in store? As a regional show, MECHANEX aims to bring the aftermarket to you, meaning wherever you are in the country there’s never a show too far away! 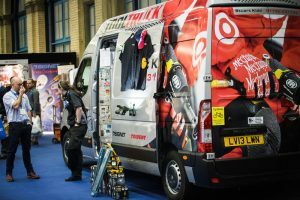 Boasting a whole array of the industry’s top manufacturers and distributors our MECHANEX Event City show covers the wide spectrum of vehicle servicing components and equipment that every quality technician will require to keep their business ‘ahead of the rest’. Taking place from 10am till 4pm on May 17th – 18th, it’s going to be a must-attend event! You wouldn’t be able to place a price on the amount of information available to your business – and what’s more it’s completely FREE to attend. ACtronics is engaged in large-scale, professional rebuilding of automotive electronic components. It rebuilds ECS’s, throttle bodies, instrument clusters, displays and much more. Visit ACtronics on stand E50 where the most up-to-date testing equipment and repair techniques will be on display. Andrew Page will be offering deals on equipment and will be running a special show offer on a two day hybrid course through AP Tech/Auto Education. The course will take place on Tuesday 21st and Wednesday 22nd of June in Warrington and is available to show visitors for £295.00 (usually £370). Visit Andrew Page on stand D90 to find out more and take advantage of this great offer. 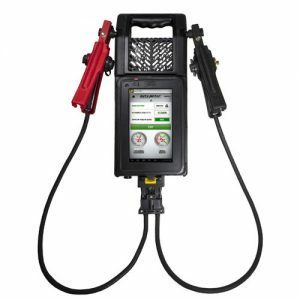 Auto Meter Technologies will be demonstrating its range of handheld battery, starter and alternator testers including the new BVA-460 tester with Bluetooth and Wi-Fi connectivity, and cranking RPM measurement. Also on display will be the latest smart battery charger optimised for AGM batteries and AMPNET software for storing battery test data online. Visit Auto Meter Technologies on stand C70 for more information and to see the products for yourself. CDIF/3 is a diagnostic device for numerous makes of passenger and commercial vehicles available on the professional market. Any visitor that buys a CDIF/3 or CDIF/3 Expert kits at the show will get a tablet for FREE! The CDIF/3 operation with an Android-powered tablet has never been so easy. The free tablet is a highly efficient, modern device with 10” display, 4-core processor, IPS HD display, 3G modem, WiFi, Bluetooth and GPS. Visit CDIF/3 Diagnostic on stand D140 to sign up and take advantage of this amazing offer. BHP UK has over 15 years’ experience in ECU remapping and over 150 dealers worldwide. The company is looking to expand this network and have dealership opportunities available in the UK. 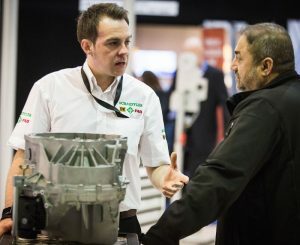 The company is offering MECHANEX visitors a unique business opportunity to become an ECU Remapping Dealerships for a special show offer of £1,250 (RRP £1,950). Visit BHP on stand D150 for more information and to take advantage of this special show price. Brian Alfred is all about getting mechanics maximum tax rebates, real quick. The team of tax experts will help you claim back hundreds (even thousands) of pounds that you’re entitled to. So if you fancy swapping MOT’s for Duty Free, have a chat with one of the tax experts in Manchester. Visit Brian Alfred on stand D102 where, provided you supply receipts, the experts should be able to calculate your rebate there and then. Visit the stand for ATE’s striking, top quality coated brake discs and brake pads and ContiTech’s online Product Information Centre (PIC) along with a range of belt drive components. 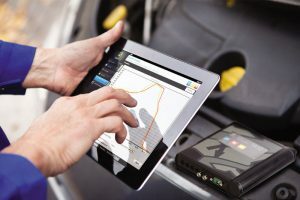 As well as that, you can see Crypton’s new wireless tablet for flexible and efficient MOT testing and a selection of garage equipment, such as the portable midrise scissor lift and combined emissions analyser. VDO’s range of diagnostic tools and pre-programmed REDI sensor, a TPMS sensor ‘REDI’ to install from the box will also be on display. Visit Continental Automotive on stand D70 to find out more. The 2016 ‘Chicago Pneumatic Pit Stop Challenge’ will be running at all four MECHANEX shows this year. Using the CP8848 Cordless 1/2” Impact Wrench, the wheel change challenge requires entrants to remove the bolts and wheel from the hub, touch the wheel to the metal base floor and then put the wheel back on the hub and fasten the five studs, in the fastest time. The best time over the two days of each show will win a CP8848 Cordless Impact Wrench. Each winner will then be invited to take part in a ‘Pit Stop Race off’ in November. The ultimate ‘2016 Pit Stop Champion’ will win a Chicago Pneumatic tools and workshop equipment prize bundle, worth £800. Ben Enter from DREAM Automotive in Watford currently has the time to beat, 17.34 seconds, which won him the prize at Alexandra Palace. Visit Chicago Pneumatic on stand C80 to try and top that time, as well as seeing CP’s latest product offering. Dayco is a global leader in the research, design, manufacture and distribution of essential power transmission components for both the automotive and commercial vehicle sectors. It is also the one of the world’s leading original equipment (OE) timing belt manufacturer and the company behind the unique High Tenacity (HT) ‘white’ timing belt. Visit Dayco on stand D20, or go to the Technical Troubleshooter seminar room at 14:45 for Dayco’s seminar on ‘Timing and Auxiliary belt system design and troubleshooting’. AutoCare is an internationally recognised garage programme providing support to over 450 independent garages throughout the UK. The programme offers AutoCare building signage, painting and branding, marketing and promotional support, lead generation, garage management software, savings on business services as well as free technical training courses. 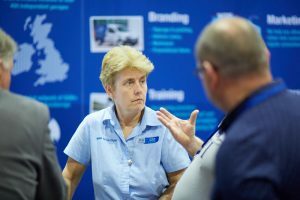 Visit Group Auto on stand C90 to find out more about the comprehensive garage programme on offer as well as its Approved Garages scheme and the technical training available. J&S Products is a supplier of premium hand tools which, during over 20 years of trading, has built up a wealth of knowledge and experience in supplying a vast range tool to mechanics via its nationwide network of independent distributions. Visit J&S Products on stand D100 to take advantage of special offers on AC Delco, Beta, Flood-it, Mayhew, Monster, Scangrip, Signet and Trident brands. KYB is one of the world’s largest manufacturers of OE shock absorbers. The experts on the stand will have information about its class products, which includes shock absorbers, coil springs, suspension mounting kit and protection kits. Visit KYB on stand E60 to race against the clock on the Scalextric track, where the fastest time in the morning and afternoon will win a prize. IFA will be in attendance at Manchester taking bookings for its Eure!Car Masterclasses. A fifth vehicle, the BMW 1 Series, has recently been added, with the focus being on Start/Stop technology and enabling technicians a hands on opportunity to work on a ‘naked’ car. Visit IFA on stand D24 for more information and to sign up. 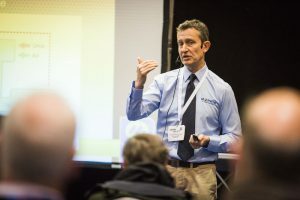 Visitors will be able to quiz PMM regular contributor Adrian Hill, Morris Lubricants’ Automotive Product manager, on any oil and lubricant-related matter. Adrian will also be hosting ‘Ask Ade Live’, a seminar on the role of lubricants in after-treatment devices and AdBlue technology in the Technical Troubleshooter room at 13:30am on both days. The first 200 visitors to stand B70 on each day will bag a free can of Morris Lubricants MD4 general purpose maintenance spray. Revive Turbo Cleaner & Power Restorer will be exhibiting at MECHANEX Manchester, where visitors can discuss the benefits of using Revive. 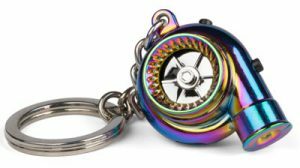 You can enter into a simple ‘fill in to win’ a Boostnatics Turbocharger key-ring with ‘boost’ sounds and LED torch. Visit Revive Turbo Cleaner on stand E34 to sign-up for your chance to win. Show visitors will be able to view and experience three powerful time-saving systems from Pro-Align, designed to help workshops unlock a host of profitable servicing opportunities. Taking centre stage will be the company’s most popular four wheel alignment system, the Hunter HawkEye Elite TD, which delivers a full 14 point alignment check in just 90 seconds. Workshops with more limited space or budget will be able to view the Hunter DSP700, a conventional alignment system that offers a high level of professional four wheel alignment servicing performance. 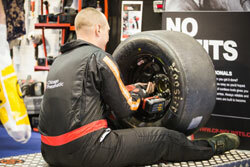 And for those workshops looking to improve their tyre changing capabilities, the fully automatic Revolution tyre changer provides consistent tyre changing times and eradicates any of the normal problems associated with changing ultralow profile or runflat tyres. 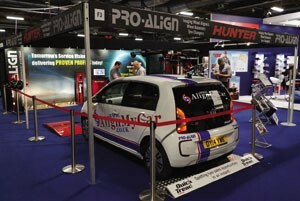 To see how any of these systems can increase your workshop profitability, talk to the Pro-Align team on stand B80, or attend the ‘Discover the six stages to successful four wheel alignment’ seminar at 10:30 in the Technical Troubleshooter room. For nearly 40 years the company has been synonymous with innovative developments. Visit stand E90 and sign up to Ring’s email updates and receive a FREE “one lamp” multi-functional torch. 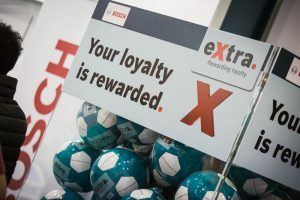 Workshops that sign up to the Bosch extra programme start collecting points right away and can qualify to win for an OBD 100. The Bosch OBD 100 is a handy workshop diagnostic tool which reads, displays, deletes and resets emission-related trouble codes. Visit Bosch on stand C140 for more information and to sign-up. Visit the Schaeffler stand to discover why the company is a trusted technical partner and original equipment supplier to some of the world’s leading vehicle manufacturers. 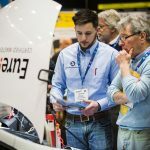 An army of technical experts will be on hand to demonstrate LuK, INA, FAG and now Ruville branded precision components, innovative repair solutions and special tools. Schaeffler’s REPXPERT portal is designed to help provide the latest product, service and fitting information to help make life easier for today’s professional motor mechanic. Visit stand F10 and to find out more about the REPXPERT portal and register for your chance to win a fantastic remote control Audi A5 DTM car. 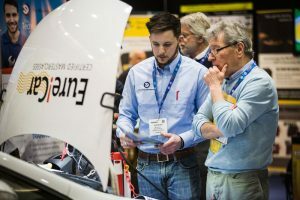 The company’s training technicians will be on the stand demonstrating how to easily modify and upgrade a vehicle’s ECU using its custom written engine maps, using the experience of over 20,000 successful remaps across its 270 outlets. Former F1 driver Perry McCarthy, Top Gear’s original ‘Stig’ and co-owner of TopGear Tuning will also be on hand to answer questions answered about his racing career, the new Top Gear presenter line-up, Jeremy Clarkson, and of course ECU remapping. Visit Topgear Tuning on stand D78 to find out how to join its growing partnership programme network, take advantage of a special MECHANEX show discount, or to quiz Perry on remapping and his career. PMM will be on stand C120, so feel free to pop by with any comments or questions about the publication, or just to say hello. There will be plenty of special guests to chat to, including former garage owner Andy Savva and Steve Carter, who are both hosting seminars, and original ‘Stig’ Perry McCarthy. The show is completely free to attend and tickets can be booked online, or by calling 0844 888 8339. For more information follow @MECHANEXShow on Twitter, or visit the MECHANEX website.